In the context of a laparoscopic cholecystectomy, it has been recognised since long that misinterpretation of normal anatomy, as well as the presence of anatomical variations, contribute to the occurrence of major intra- and post-operative complications, especially biliary and vascular injuries. It is important for surgeons to appreciate basic anatomical facts as they apply to the performance of safe laparoscopic cholecystectomy. Such injuries, in turn, can cause significant morbidity and occasionally even mortality. This case report addresses a very rare congenital anomaly of preduodenal portal vein (PDPV) encountered during laparoscopic cholecystectomy. A 56-year-old woman presented for elective laparoscopic cholecystectomy. At surgery, severe omental adhesions with gallbladder were found. Fundus of gallbladder found to be intrahepatic. Pylorus and 1st part of duodenum had flimsy adhesions with gallbladder. During separation of adhesions, a blue tubular structure was found to be going to liver bed near infundibulum of gallbladder [Figure 1]. Traced inferiorly, it was seen to run anterior to the duodenum and then disappeared into the fat anterior to pancreas [Figure 2]. Further dissection to further delineate the course was not done. Cystic duct was going posterior to this vein, no artery was identified in Calot's triangle and an artery was entering the gallbladder into the body region directly from the liver bed. Rest of procedure completed as usual. The patient subsequently made an uneventful recovery and discharged on the next day. PDPV usually presents in the paediatric population as it is the associated congenital anomalies that draw attention to its presence. In 1921 Knight, during an autopsy described this anomaly in a human for the first time. In 1926 Schnitzler, was the first to operate on a case of duodenal obstruction caused by a PDPV. In 1974 Braun et al. reviewed the literature and found only 41 reported cases of PDPV from 1921 to 1974. Of those reported, 27 were in children younger than 10 years of age and 12 were in adults. In two cases, the ages were unknown. Thirty-four (83%) of these cases were associated with other multiple congenital malformations. Intestinal malrotation was associated with 80% of these cases, situs inverses with 40%, pancreatic malformations with 33% and biliary atresia, duodenal stenosis or atresia with 13%. In the majority of these cases, it was the associated malformation and not the PDPV that was the primary reason for operative intervention. In adults, it is usually asymptomatic and is an incidental finding at elective surgery for an unrelated condition. Only Bhorat et al. in 2009, reported a case of PDPV in elective laparoscopic cholecystectomy which was then converted to open cholecystectomy. This rare anomaly is never taught in our teaching curriculum. Our case report aim is to highlight this very rare anomaly to the surgeons doing laparoscopic cholecystectomy as injury to the portal vein will result in high morbidity and mortality if unrecognised. The authors certify that they have obtained all appropriate patient consent forms. In the form, the patient has given his consent for his images and other clinical information to be reported in the journal. The patients understand that name and initials will not be published and due efforts will be made to conceal identity, but anonymity cannot be guaranteed. Strasberg SM, Hertl M, Soper NJ. 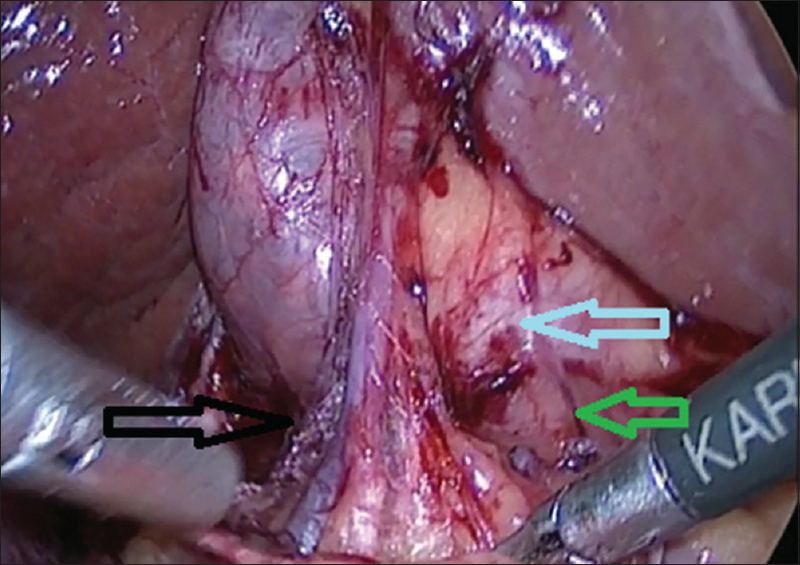 An analysis of the problem of biliary injury during laparoscopic cholecystectomy. J Am Coll Surg 1995;180:101-25. Nagral S. Anatomy relevant to cholecystectomy. J Minim Access Surg 2005;1:53-8. Skandalakis JE. Surgical Anatomy: The Embryologic and Anatomic Basis of Modern Surgery. 1st ed. Athens, Greece: Paschalidis Medical Publications, 2004. Knight HO. An anomalous portal vein with its surgical dangers. Ann Surg 1921;74:697-9. Schnitzler J. Ueber eine cigentumlicle ‘missbildung mit stenosierung des mlagenausgangs'. Med Klin 1926;22:723. Braun P, Collin PP, Ducharme JC. Preduodenal portal vein: A significantentity? Report of 2 cases and review of the literature. Can J Surg 1974;17:316-9. 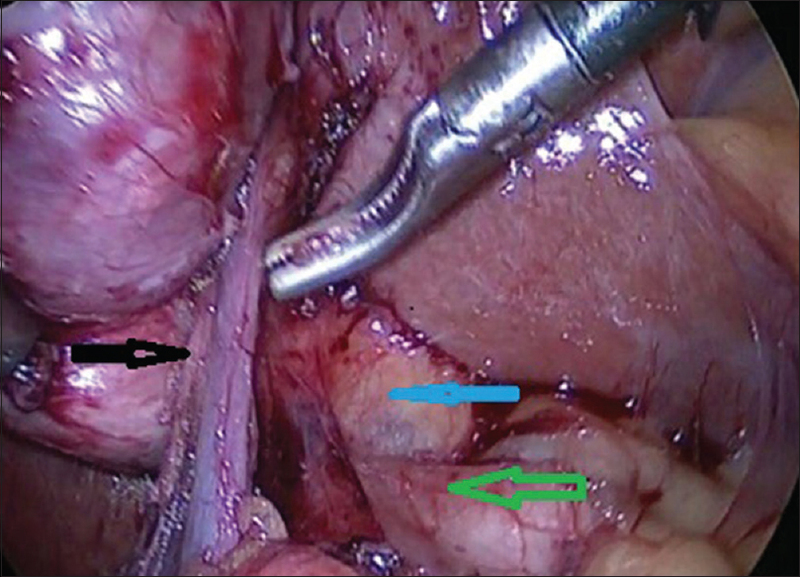 Bhorat N, Thomson SR, Anderson F. Preduodenal portal vein: A potential laparoscopic cholecystectomy nightmare. S Afr J Surg 2009;47:17-8.